Our Secret is the Bouquet Drive. 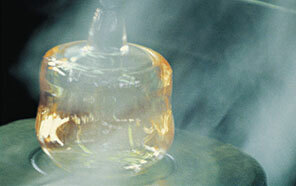 We’ll start with the foot: The flat execution provides stability and elegance to the glass. The weight of the foot determines whether the glass has the proper balance in your hand. And in conjunction with the length of the stem, which is designed in a barely perceptible x-shape, it can also be elegantly held with all five fingers. 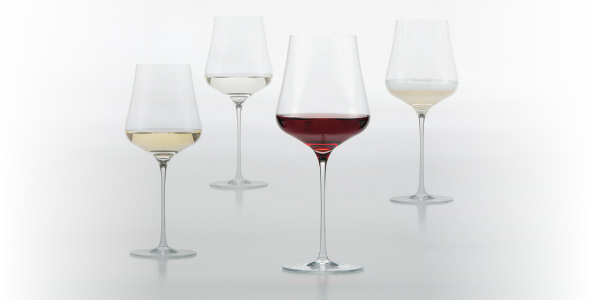 The glass cup itself combines several, extremely important features that differ significantly from the conventional wine glass! The lowest cup portion is held in a slightly outwardly curved V-shape. With this design a small amount of wine creates a «push-up» effect and reaches the largest surface area in the glass. This is ideal for rare wine tastings, for winemakers, who provide tastings, for restaurateurs, who offer bottles of wine as an eighth or tenth of a liter and for private enjoyment because even in a half empty glass so much fragrance is absorbed. In the center of the bottom of the glass there is a V-triangle that provides maximal color density. Unfortunately, many expensive wines often lose much of their original color in a flat-bottomed glass and then appear rather thin which creates a less attractive first impression. The position of the widest area in the glass is only 90 millimeters from the glass rim. This permits a maximum of conversation with the wine and there is no loss of flavor as usually occurs with a longer distance. The lower, special glass shape provides an incredible «bouquet-drive»! While in normal bulbous glasses the wine moves like thick bangles centrifugally through the glass and this action causes the aromas to be caught like hamsters on a wheel. 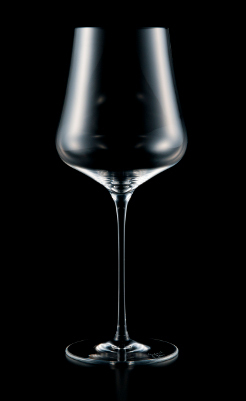 With the GABRIEL-GLAS©, however, fine ranging turbines are created, which propel the released aromas upward in a multifaceted spiral and bring out a never before experienced perfume from the wine. The glass shape between the bowl and rim is subtly conically curved inward. This allows for optimal bundling of the bouquet. When drinking the wine, the heavy volatile substances are again mixed with the lighter flavors, because they are overturned like the action when a wave breaks. This phenomenon is not possible in a bulbous glass. The gently tapered shape – similar to a funnel – corresponds precisely to the channel of the nose. So no false air is added to the bouquet and the aromas released are guided directly 1:1 to the nose. 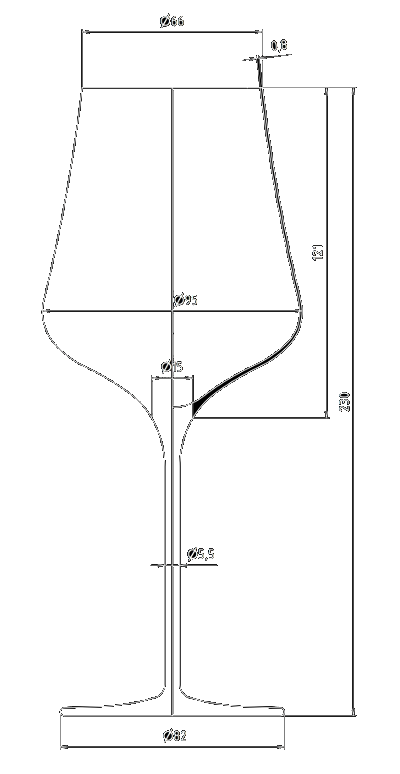 The wine itself is closer to the nose due to this design and flows «wider» compared to other glasses. This also improves the aromas. The decisive factor is the chosen opening of the glass that measures exactly 66 millimeters. If the opening is too small (especially with bulbous glasses) a greasy film may form on the bouquet that conceals the aromas. If the opening is too large, the aromas are lost and the bouquet cracks, gets dry or disintegrates completely. It is right at this point that the GABRIEL-GLAS© delivers the maximal complexity of the wine and the very thin film above the «nose game» binds all the subtle aromas into one dream bouquet. When enjoying the wine, the entire nose can be placed in the glass and makes drinking it easier because you do not have to move your entire head backwards to allow the wine to flow onto your palate. Moreover, before the very much anticipated first sip, one is very close to the bouquet. Very important: The wine flows much broader in the Gabriel-Glas in contrast to the normal bulbous glasses and distributes the wine more broadly on the tongue so that each tiny taste bud is reached. The machine blown GABRIEL-GLAS © weighs only 150 grams. The hand-blown GOLD-EDITION weighs only 90 grams. Because both versions are produced using a single manufacturing process (bowl and stem!) their break resistance is extraordinary. The glasses are so stable that they can be washed in the dishwasher without any worries. High quality crystal glass is used for both variations (standard and gold edition), which compared to lead crystal is stronger, more scratch resistant and break-resistant. It is suitable for all wines, including champagne, whiskey, brandy, port wine and even for some of the finest beers.